Leard Forest is a rapidly disappearing area of bushland located between Narrabri and Boggabri in north west NSW. The forest is home to hundreds of species of plants and animals and includes habitat for dozens of threatened species and several endangered ecological communities. The nearest township is the small farming hamlet of Maules Creek, which sits at the foothills of Mt Kaputar National Park. Deep in the earth, under Leard's trees and soil, is a deposit of coal. And so, Leard Forest is slowly being bulldozed and transformed into a series of open-cut pits, from which the coal is mined. This coal is then put on trains and carried to the port of Newcastle where it is exported to nations that will burn it — further polluting an already too polluted earth and fueling the climate change that we know is happening, that we know we are causing, and that we know threatens the survival of our species and every species. There are immediate localised consequences too, those for which the local Aboriginal community and the farmers of Maules Creek bear the brunt. Sacred sites that once sat undisturbed in the forested land, now lost to the mines. And there's the coal dust pollution suffered by the people of Maules Creek, as well as the social costs that come with the transformation of a community from one dominated by farming, to one dominated by mining. For a few years I spent a great deal of time in and around this forest, working with people trying very hard to protect it from coal mining. This is not a victory story. The forest is becoming smaller with each passing year as the mines bulldoze the trees to dig their pits. Open-cut coal mining in Leard Forest. 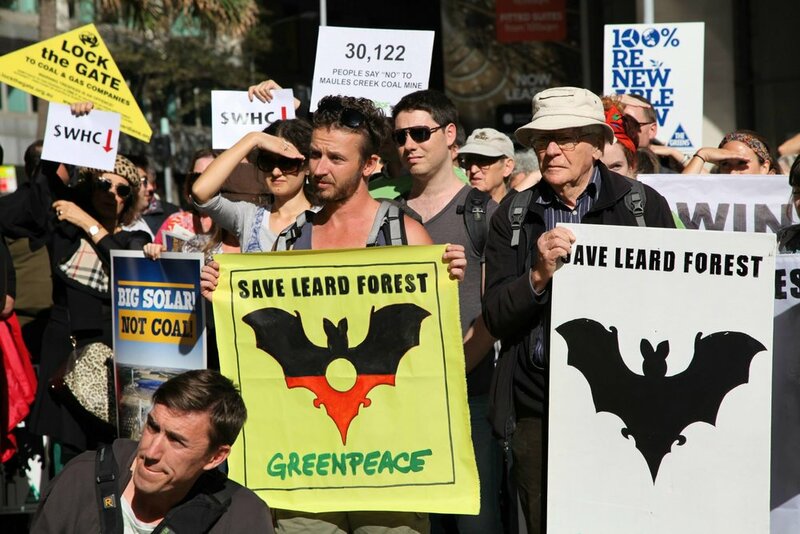 The protests against mining Leard Forest were creative, and there were little victories along the way. People showed up to stop bulldozers in the forest, and they showed up in the city to take the government as well as the mining company's board and executives to task. So maybe this is a 'never again' story, and maybe the victory will be stopping the greenfields coal mine proposed for development in the Bylong Valley, maybe it will be stopping Adani and keeping the area of central Queensland known to some as the Galilee Basin from becoming a massive expanse of coal pits, maybe it'll be that no new coal mine will ever be proposed again without a whole lot of people joining forces to give the government and coal companies one hell of a fight. Maybe the victory was just that we showed up and tried. Looking out over the edge of Leard Forest and the farmland that surrounds it. The campaign that was mounted in an attempt to protect this forest from being lost to mining was diverse, bold, and long-running. It involved people from many different communities including Gomeroi people, farmers from Maules Creek, people from nearby larger regional towns and farming communities across the north west, people from Newcastle where the port that would export the coal dug up at Maules Creek is located, and people from further afield in places like Sydney too. When 75 year old Tamworth based engineer Raymond McLaren risked arrest during a protest on the frontline in Leard Forest, he said, "This protest is a remarkable convergence of people with a common interest in protecting a unique forest. I am here to defend the forest." Like many who joined the campaign to protect Leard Forest, Raymond was not the type you might expect to see on the frontline of a blockade to stop a coal mine. Locked on, blocking access to move heavy machinery into the forest for the development of the mine. McLaren, like so many of the people involved in the campaign to protect Leard, had never taken part in a protest like the one he stepped up to be part of. 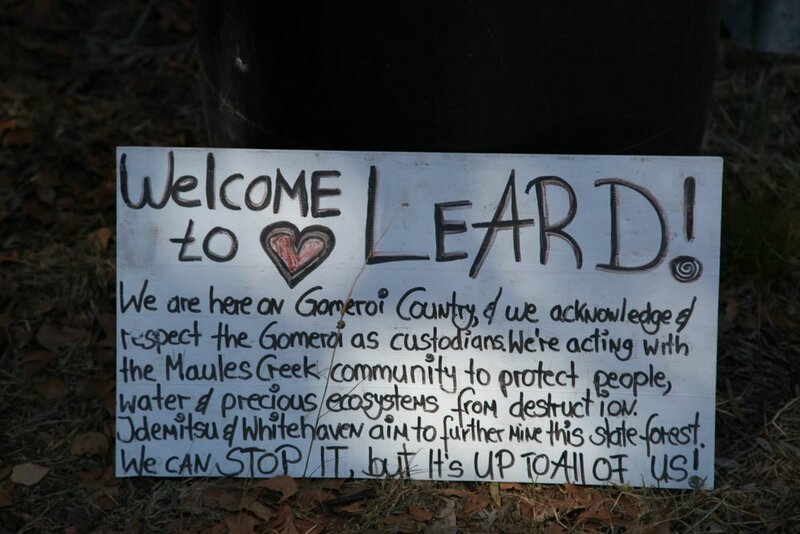 People came to defend Leard, compelled by a sense of justice: for the forest, its plants and animals, the river and groundwater supplies, the Gomeroi people and their sacred sites, the local farmers, their crops, cattle, and the tiny rural hamlet that is their home, and, of course, for the climate. 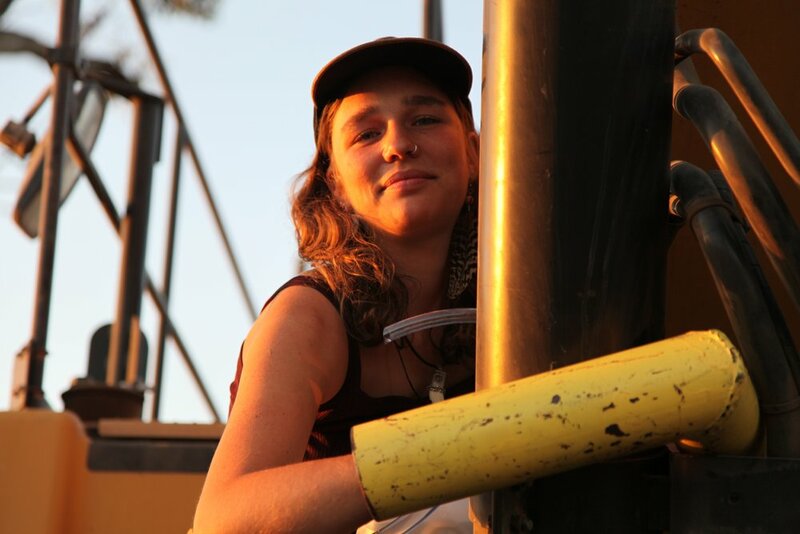 These are some of the pictures I captured of moments on the frontline at the forest blockade camp, as well as in Maules Creek, Narrabri, and Sydney too. When the protest camp had to move from its original home in the forest, Maules Creek farmer Cliff Wallace stepped up and welcomed people at his place which became affectionately known as Camp Wando. It wasn't all protests, here Emma and Jules practice acroyoga at Camp Wando in Maules Creek. Gomeroi woman Dolly Talbott speaks at a rally in Gunnedah. Solidarity from people rallying in Sydney's CBD. 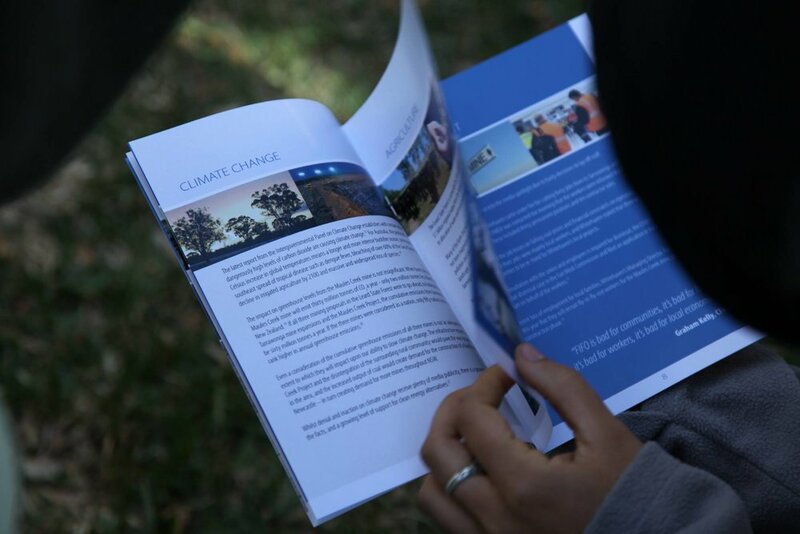 A brochure in the style of the brochures created by the coal company - this one created by protesters to give to shareholders at the Whitehaven Coal AGM, tells the story of what the company's coal proposal means for the environment, climate, agriculture, and community. Giving shareholders information about Maules Creek and Leard Forest as they enter the company's Annual General Meeting. 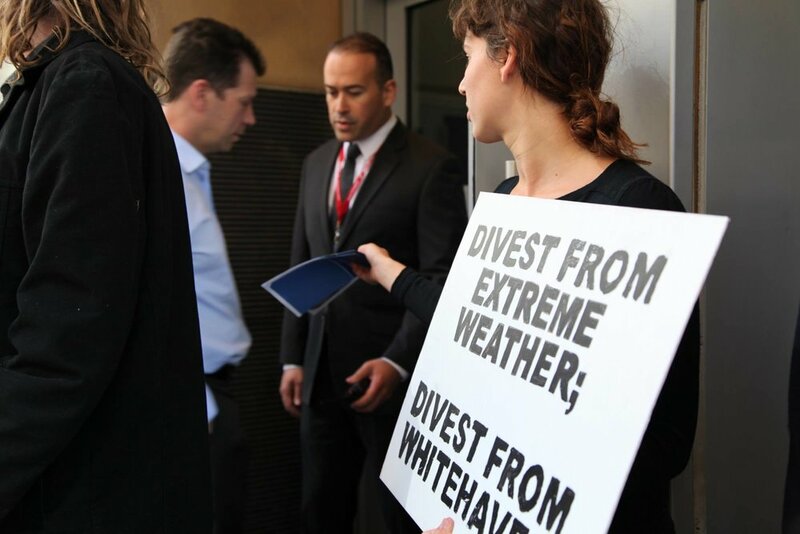 These protest signs were used on the frontline in Leard Forest, and outside the Whitehaven Coal company AGM in the city. Before Mark Vaile was the chairman of the coal company digging up a forest in regional NSW, he was the Deputy Prime Minister, and leader of the National Party (the party that considers their key constituents to be farmers and regional people). 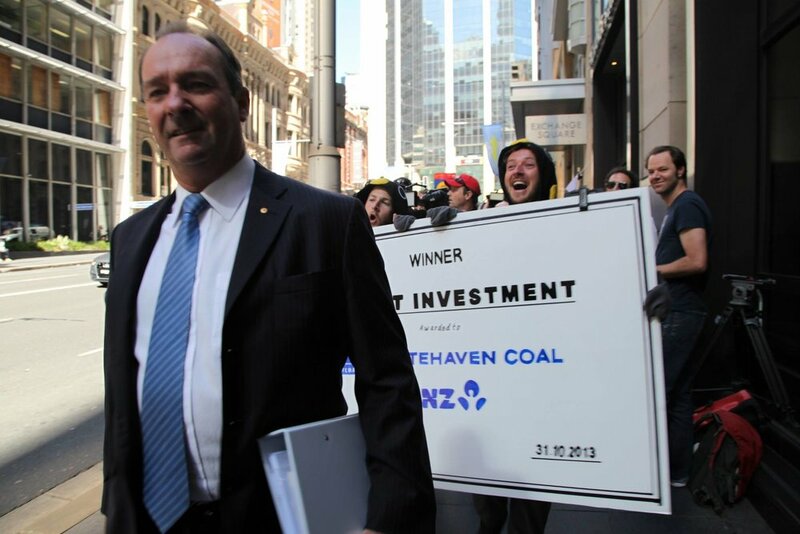 Here Vaile is pursued by protesters with a 'Winner: Worst Investment' award as he makes his way down a Sydney street toward the Whitehaven Coal AGM. Coal mines are expensive, and coal companies require access to large amounts of money to do the damage they are doing. That's why campaigns for divestment from fossil fuels are such a powerful form of protest. When Whitehaven Coal sought to mine the Leard, Australian bank, ANZ, provided a $1.2 billion loan facility to the company. This loan was primarily intended to develop Whitehaven's 'Maules Creek Coal Project' in Leard State Forest and on adjacent farmland near Maules Creek. In January 2013, Jonathan Moylan issued a press release on ANZ letterhead saying the bank had withdrawn its $1.2 billion loan facility from Whitehaven’s Maules Creek Coal Project on environmental and ethical grounds. 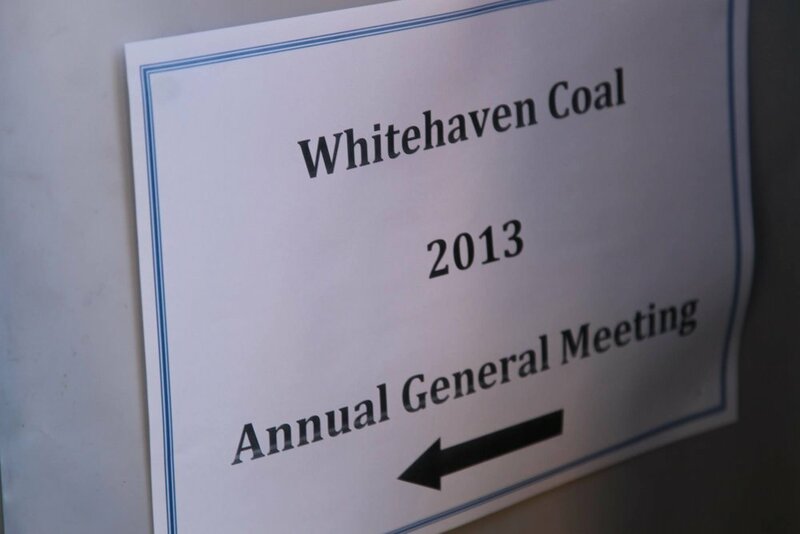 On the day of the hoax, Whitehaven Coal’s share price dropped from $3.52 to $3.21 before a trading halt, and bounced back to $3.53 within an hour of trading resuming. You can read the story of how it all went down here. "I bear the consequences for an action that I took, an action that unexpectedly caused a panic on the trading room floor. Rural communities, on the other hand, as well as the world’s most vulnerable people, affected by rising sea levels and crop failures, are paying the price for decisions they had little control over, while the benefits accrue elsewhere." Rick Laird is a farmer from Maules Creek whose family has farmed in the district for over 150 years. Rick came to show his support for Jono outside court in Sydney, and said in a media statement at the time, “To most people ANZ is just a bank, but to our community at Maules Creek their loan to Whitehaven Coal threatens to put an end to 150 years of farming in the region. We’ve been fighting this mine for years but what Jono did means the world knows what is happening to Maules Creek farms and the Leard State Forest." A few months after Jono's sentencing, the battle for Leard Forest and Maules Creek attracted national attention again. Former Wallabies captain David Pocock was arrested after he joined fifth generation Maules Creek farmer Rick Laird in a protest where they locked-on to mining machinery in the forest. Pocock's statement about his decision to take part in this action is worth reading. It feels unfair to tell just a few of the high profile stories from these years, though if I were to tell more of the stories I'm not quite sure where I'd begin (or end). It would be impossible to mention all of the people (there were thousands) who took part in all of the actions (there were so many) to defend Leard. These pictures only scratch the surface of the moments that made this campaign so special.